management, infrastructure, data and analytics. When did you start thinking about becoming a trustee? I started thinking about Board roles whilst at UBS in about 2012. UBS sponsored Women on Boards membership and I attended several events and began to understand more about Boards, their remit and how and when my experience could translate. I knew that the time would come when my full time corporate career would be over and the idea of building a portfolio of roles took shape. Board work was to form part of that and I knew that to be successful in paid Board roles it is essential to take on pro-bono roles to gain experience. 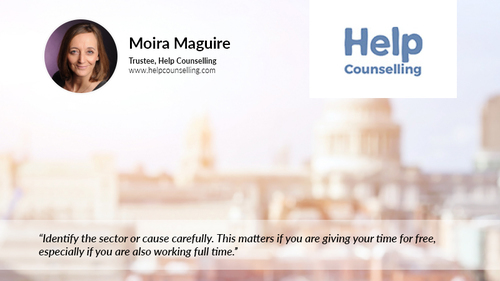 As the very first success story, you were appointed as a Trustee at Help Counselling Centre – what can you tell us about the experience so far? a little slower than I am used to, so I must remember that and adjust my style accordingly. The only challenge has been to remember the more operational aspects of HR that I have not handled for a while. What do you feel that you have brought to the charity? I have put my business and change management experience to good effect as well as bringing in my specific HR skills and keeping the Chair and other trustees on track through some important staffing decisions. My COO experience has allowed me to advise the Chair on a range of issues and I have been given autonomy to present ideas, recommend action, draft communications, and introduce expertise from my network. My broad background has made me credible with other trustees as I have been able to contribute in a range of areas. What does your trusteeship mean to you? I find the work interesting and fulfilling. I am very connected to the sector Help specialises in, and contributing to the future strategy feels good. Can you offer any advice to those in our HR network looking to become a trustee? Identify the sector or cause carefully. This matters if you are giving your time for free, especially if you are also working full time. Do your research on the charity, its background, financial health and the composition of the Board. In many ways you use the same evaluation skills as if you were applying for a new role in HR. Being entrepreneurial and resourceful is also important. Why do you think it is so important for small charities to have access to HR professionals for their board? things work so HR expertise can really help to make sure all aspects are well managed and that the link between the Board and the employees and volunteers is effective. What would enable the charity to do more? The most immediate challenge is funding and financial management. The second area is technology and finding ways to improve infrastructure, and the third broad area covers branding, PR, social media and communications.